Was born in London in 1853. He is son of the late Sir George Johnson, M.D., F.R.S., F.R.C.P., of Savile Row, Physician-Extraordinary to her late Majesty Queen Victoria. 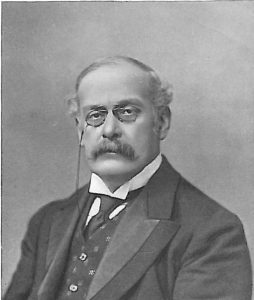 Mr. Johnson was educated at Marlborough College. He commenced his yachting career in 1893, becoming the owner of Moonbeam, 25 tons, built by William Fife, senior, of Fairlie, in 1858. He owned her for six years, cruising and sometimes racing her. His next boat was Moonbeam II. 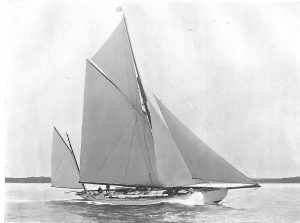 (now Chione), cutter, 42 tons, designed by Mr. Shepherd, and built by Messrs. White Bros., of Southampton. She is a sound, wholesome cruiser, and won a few races, being good in heavy weather. In 1903 William Fife, junior, designed and built the present Moonbeam to Mr. Johnson’s order. She was the first of Mr. Fife’s fine modern fleet of yawls, which includes, besides Moonbeam, Valdora, White Heather, and Rosamond. Moonbeam, though only occasionally raced, has secured a number of prizes. She is a beautiful boat, and though fast, has unusual accommodation ; indeed, she was chosen by Mr. Fife to demonstrate the amount of accommodation which could be put into a boat of her type. Her owner has cruised in her considerably, and in one year sailed some 5,000 miles. Mr. Johnson is a member of the firm of Messrs. Johnsons, Long and Co., of Lincoln’s Inn, and is a keen collector of books, his extensive library num­bering some 6,000 volumes, mainly first editions, and including a large collection of yachting literature. He has written a good deal on bibliography, and is the possessor of one of the finest collections of yachting prints, including many of great rarity. He is Vice-Commodore of the Fowey Yacht Club. Mr. Johnson is a member of the Management Committees of the Children’s Hospital, Great Ormond Street, the Royal Eye and Royal Dental Hospitals, and assists the last two charities as honorary solicitor. He is also on the Board of Directors of the Legal and General Life Assurance Society and the Law Fire Society, and is a member of the Biblio­graphical Society and of The Sette of Odd Volumes. Clubs: Fowey, Royal Thames, Royal South-Western, Royal Southern, and Yacht Racing Association. Residence: 14, Cavendish Place, Cavendish Square, W.